Over the last few month 1-2 a week our newspaper was missing. This, most of the mornings, really ticket me off as it disrupted my breakfast routine. A while later I got a letter from the courier announcing that in our neighborhood newspapers get stolen. I need my morning newspaper even though there is hardly any news in there. I considered cancelling the subscription but realized that I was not ready to let go of this habit. I also grew curious who would steal newspapers when most of the news was freely available on-line. Maybe one of my lovely neighbors had a dark side. So I took the challenge and set out to solve this mystery. I ordered a Samsung SNH-P6410BN in-door and Samsung SNH-E6440BN outdoor wireless IP security camera. These are really great Hi-Def cameras with a wide field of view and good picture quality during daylight as well as at night. The camera comes with pretty decent cloud support and an Android and iPhone app. It can store the video feeds to microSD cards that can be inserted into the cameras. However I did not want to fiddle with SD-cards as the camera is connected to my network and I hoped that additional software could help me out. I was intrigued by 3rd party Video Software like BlueIris that could in fact connect to my cameras video streams. However I was mostly interested in dumping these streams to a hard drive so that I could zap through them with VLC. That is when I started to look into ffmpeg. What a tool this is! The Swiss-Army knife of Video. Is there something that cannot be done with this utility? However, the flexibility comes at a price. There are so many options and parameters that exploring them feels like an entry riddle to a secret society. That said, the ffmpeg user community is large and there are many example and posts that are available on the internet to get you started. This line dumps the input video stream into the file VideoDump.mp4. The option “-vcodec copy” makes sure that the stream is not re-coded so the process hardly takes any CPU resources. This worked really well. However the files started to become big as a 1920×1080 stream uses about 1 GByte of hard disk space per hour. Is there a way to split the files into 1hour segments? You bet! Adding the option “-ss 00:00:00 -t 02:30:00” will capture 2.5 hours of footage and then stop. I then used a cron job on my Mac to start the stream capturing. 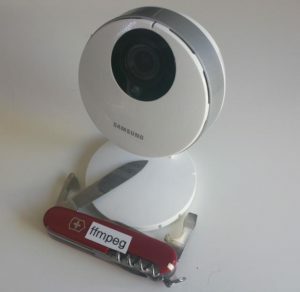 In summary ffmpeg works great with the Samsung IP cameras and allows to capture videos exactly during the hours of interest. So coming back to the missing newspaper, you wonder who the culprit was? Well to my surprise there was no thief. The footage clearly revealed that the newspaper never got delivered the days it was “stolen”.